New year, same crazy schedule. But just because you’re short on time, doesn’t mean you can’t grab delicious, healthy food at affordable prices. Vancouver has many convenient over-the-counter options for those who aren’t willing to sacrifice good nutrition to stay on schedule. 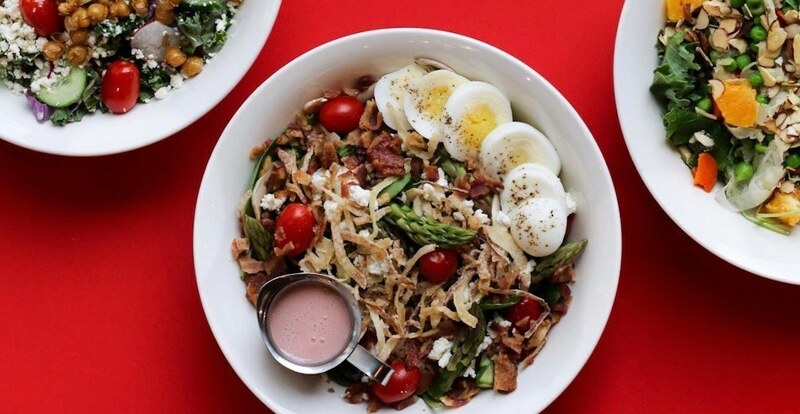 Here are 14 Vancouver spots where you can get healthy grab-and-go fast food. SMAK fuels Vancouver with healthy fast food from its two locations. Smoothies, oatmeal, salads, hot bowls, soups, protein boxes and a variety of other organic, vegetarian, dairy and gluten-free options are on the menu. In addition to light options this place also serves up hearty meals like chili and chicken curry. While MELU is known for its smoothies and cold-pressed juices, it also has a ‘solids’ menu full of healthy, filling meal options. 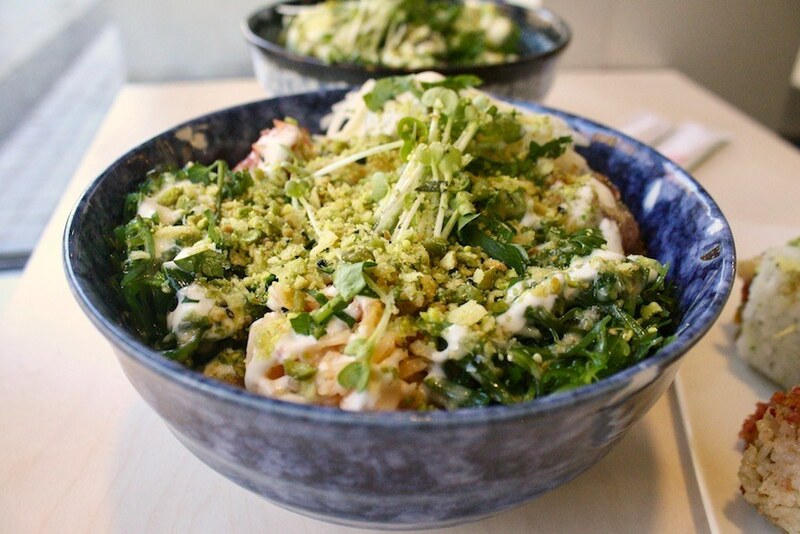 With a handful of salads and dishes like the “Undercover Spaghetti” and “Undercover Curried Rice” (both vegetarian), and a hot menu full of build-your-own-hot-bowl options, MELU is a great place to head for a quick bite on the go. 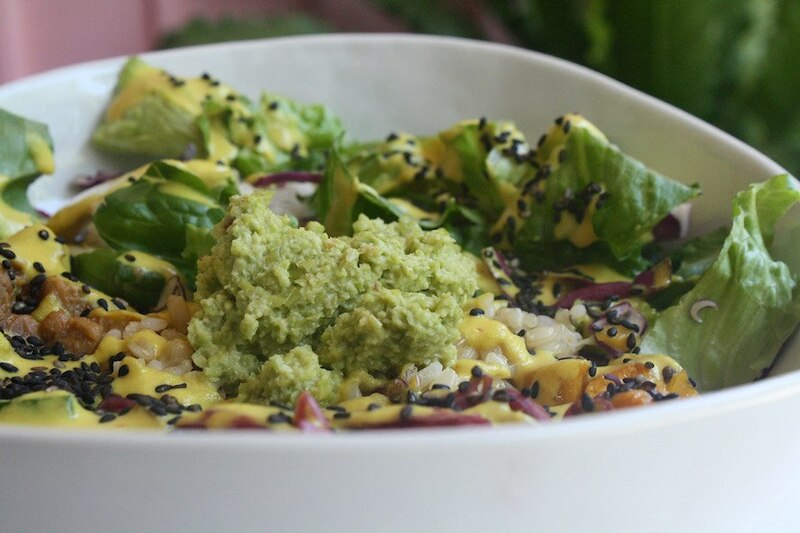 Peqish’s offerings are all made in-house from scratch and many of them are vegan, dairy free, and gluten free. This spot offers a selection of breakfast wraps, smoothies, salad boxes, soups, “Go Protein Boxes,” and a variety of sandwiches. There are healthy options for breakfast, lunch, and dinner at Nosh on West Georgia Street. Try Nosh’s signarute breakfast wraps, quiche, sushi wraps, salads, and soups for a quick and filling meal or opt to customize your salad at their build-you-own bar. Railtown Cafe has an impressive selection of healthy, housemade dishes to choose from at both of its locations. Fresh sandwiches, soups, and a make-your-own salad bar make this spot a no-brainer for healthy fast food. 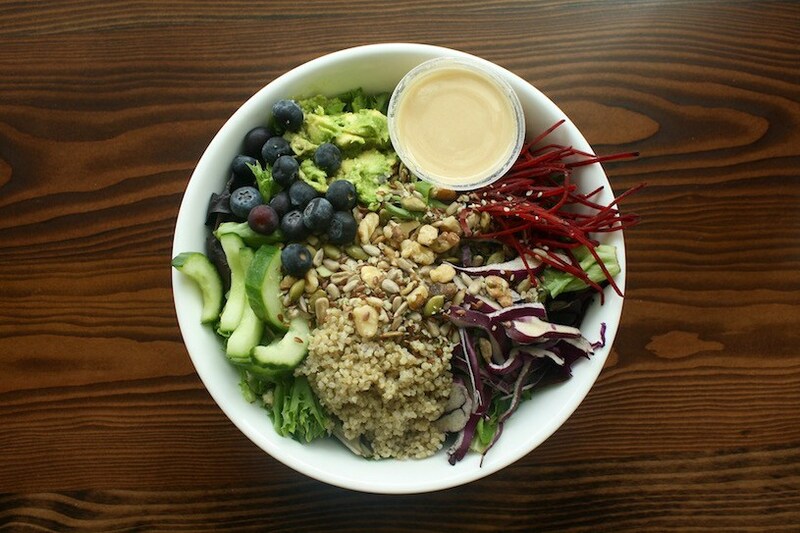 The Freshii franchise is a solid place to go if you’re looking for a meal to fuel you through your busy day. Check out the over-the-counter selection of salads, soups, bowls, and wraps and burritos bundled in whole wheat wraps. The Juice Truck has way more to offer Vancouverites than just their stellar cold-pressed bevies. Try their smoothie bowls, lunch bowls, spring rolls, and killer caesar salad and you’ll find yourself heading to the cafe and truck more than ever before. Tractor has some incredible dine-in and take-out options featuring good wholesome eats. Head to one of Tractor’s four locations to check out a long list of veggie salads, proteins from the grill, soups, stews, salads, and sandwiches. The offerings from Field & Social are always packed with fresh, tasty goodness. Choose from housemade salads, bowls, and daily soup selection for a guaranteed delicious meal. Whether it’s a juice, nut mylk, soup, or avocado chia toast you’re after–Glory’s got everything you need to enjoy a successful healthy and fast meal. Salads galore and delicious seasonal ingredients aplenty, Verdura is a definite spot to stop if you’re in the Main Street area and looking for a healthy bite. Colourful and fresh, everything from Assembli is made to order with non-GMO, hormone-free, antibiotic-free, and local and organic ingredients. Exercise a little self-control and opt for one of their stellar salads over the fresh-made pizzas for a light and energizing meal. Macro bowls and Coco Whip are just a few of the healthy offerings from this Millenial pink vegan paradise located in the heart of Chinatown. Make-your own sandwiches and wraps at this spot that offers fresh-to-death ingredients and cold-pressed juice. One of Vancouver’s many poké spots, Pacific knows what’s good when it comes to fresh and flavourful ingredients. Ocean Wise fish and rotating seasonal specials make this spot one of our favourite places to grab Hawaiian delicacies in the city.